Createspace Independent Publishing Platform, 9781518815232, 108pp. **2016 Finalist Next Generation Indie Book Awards*** Long ago, documents proving the existence of a secret life, were buried, forgotten. Until the 20th century when archaeologists discovered the first of them in ancient Egypt. As more documents were unearthed throughout the world, a connection between them was made. These are the preserved and translated scrolls of a woman who lived thousands of years ago, and for thousands of years. A woman on a quest to preserve her unique race. A woman who lives on the blood of humans. In this compelling and unique adventure, written as translated scripts found by archaeologists, Sands of Time sweeps the reader back to ancient Egypt where we read the scrolls of Kesi of Giza, the "Nile's Graceful Queen," a hybrid blood drinker with an exciting and exceptional past. From the sands of ancient Egypt, to the arms of a Roman soldier. From hiding in 13th century London, to dying in post Jacobean Scotland and through Revolutionary France, this short page turner is packed full of adventure, betrayal, mayhem and mystery as the first of Kesi's epic search for a way to share her bloodline begins. This is a series that will delight vampire fans looking for a fresh take on an old genre. The historical aspect of the book will also thrill those looking for exploration into a past not told about in school books. 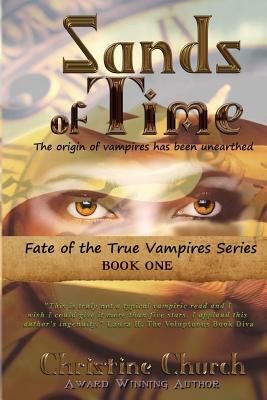 Praise for Sands of Time: Fate of the True Vampires: "Above and beyond conventional vampire stories...The writing style is unusual and interesting...Sands of Time does not drag its way into boredom. The story is compelling enough to keep the reader turning the pages." Lex Allen, Reader's Favorite "This is truly not a typical vampiric read and I wish I could give it more than five stars. I can't wait for the release of the second book and I applaud this author's ingenuity." The Voluptuous Book Diva "There is some commonality with the lore of vampires found in] Anne Rice's Vampire Chronicles, yet Ms. Church's] vampires have an alternate origin that incorporates theories of the purpose of the great pyramids and how they were built. The story thankfully lacks the teen angst of Stephanie Meyers' Twilight series and has much better writing than what I've read in those and related supernatural romance books about vampires." Meribast Amazon 'I found the characters in Sands of Time to be believable, real and each motivated by their own truths. I genuinely cared about them all, including Yin (wait till you meet him) and could see why they behaved in the way that they did." Fiona Tate.